Papo de anjo or papo-de-anjo , roughly translated as "angel's double chin", is a traditional Portuguese dessert made chiefly from whipped egg yolks, baked and then boiled in sugar syrup. The name is typically pronounced [ˈpapu ˈðɐ̃ʒu] or [ˈpapu ðɨ ˈɐ̃ʒu] in Portugal, [ˈpapu dʒi ˈɐ̃ʒu] or [ˈpapu ˈdʒɐ̃ʒu] in Brazil. Like fios de ovos and several other classical Portuguese sweets based on egg yolks, papo de anjo is believed to have been created by Portuguese nuns around the 14th or 15th centuries. Laundry was a common service performed by convents and monasteries, and their use of egg whites for "starching" clothes created a large surplus of yolks. According to most recipes, the yolks must be whipped until they swell to double their original volume. Some recipes also call for egg whites (1--2 whites for each 10 yolks), beaten separately to stiff peaks consistency and gently mixed into the yolks. The mixture is then poured into greased muffin forms (about 1/2 tablespoon each) and baked until they are firm but still without crust. The pieces are then boiled lightly in the syrup, which may be flavored with rum, vanilla, or orange peel. ^ Marina Alves (2008), Dos deuses[permanent dead link]. Online article, Jornal da Pampulha, Belo Horizonte, accessed on July 5, 2009. ^ Jornal Zero Hora (daily newspaper), recipe for Papo de Anjo. Online version at terra.com, accessed on July 5, 2009. ^ O Estado de S. Paulo (daily newspaper), recipe for Papo de Anjo. Online version Archived 2012-03-30 at the Wayback Machine at newspaper's site, accessed on July 5, 2009. ^ George Erdosh (2003), Rare finds - Enjoy this South American food tour. Better Nutrition magazine, Vol. 65, issue 4 (April 2003), pages 36–38. ISSN 0405-668X. Online version accessed on July 5, 2009. 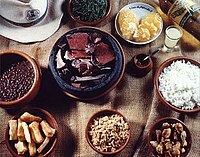 This Brazilian cuisine-related article is a stub. You can help Wikipedia by expanding it. This page was last edited on 30 September 2018, at 17:11 (UTC).